So you’ve decided to start writing a blog. It’s like creating a mini-magazine of your own – but what are you going to call it? There are millions of blogs already out there – what are you going to call yours, and how do you ensure that it’s unique? First of all, don’t be put off by the challenge of creating a blog name. Thinking up a name for your blog is one of the hardest parts about creating a blog – but it’s also one of the most fun parts too. If you’re thinking of a name, Google it to check that somebody’s not already using it. You might as well be an innovator rather than an imitator. One way to stand out is to make up a word – when we started Eljae we made up the title from our initials – El = L for Lia and Jae = J for Joanne. At first we wanted to call it Eljay but somebody had already registered the .com for that. I’m glad though – it’s turned out to be the right name for us. Naming your blog after something flexible or a bit random gives you lots of choice. If you name it after your latest craze, you might end up regretting it in six months’ time. You can name it after something you’re interested in, like these great kid bloggers: Feed Me Books Now, a teen book blogger, Fashion Belle, a style fan, or The Fab Fun Food Club, a cookery blog with a twist. Make it as short as you can – or at least if it’s long, make it memorable. Phew! That’s a lot to consider. That’s why it’s important not to rush into naming your blog. Open up your favourite book, or the dictionary for word inspiration. Write a few possible names down in a notebook and sleep on it for a night or two before making a decision. 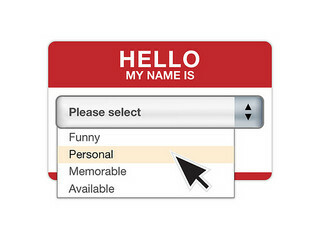 Try not to get too attached to one name in particular until you’ve checked if it’s available. Above all, have fun choosing a name for your new blog. It’s like naming a baby, except nobody minds if you call it something stupid! I decided on my blog’s name, “The Ups and Downs of My Not-So-Average Life” because of the thing that I used to do when I was younger. In fifth grade, I used to write mini-status reports on what was going on during the day. But everything that happened everyday was weird, after dealing with homework at taekwondo, school, homework, ice skating, dance class and my usual home craziness. I decided on my blog name, allkidscatholic.org, because of the message I wanted first-timers to get. I hoped that ‘All Kids Catholic’ would sorta be like saying: “Welcome all kids! And we are Catholic, so don’t be scared to come visit sometime, all you children who like a fun-friendly-Christian environment!” Sure that’s a long message, but that’s something I can get from the name. So basically, your name should include something that tells a key element for your site. But, of coarse, that’s just my friendly little opinion. This is practically an indication of carrying out God’s will- which is that all soughts of men be saved and come to an accurate knowledge of the truth. God is truly with this people.